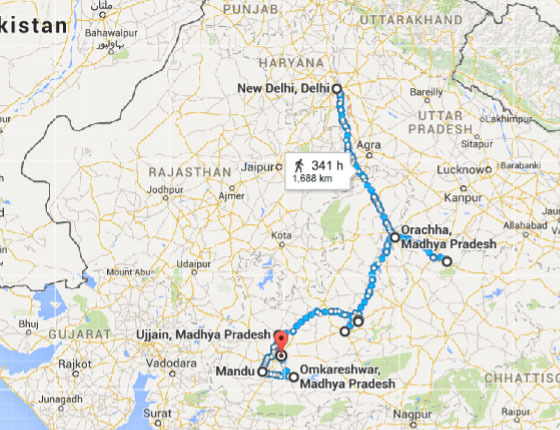 Below we try to present a suggested itinerary in the name of classic Tour of Madhyapradesh (which start from Delhi-Khajuraho and end at Indore- Delhi/ Mumbai to the next destination. 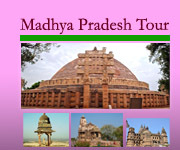 Which cover cultural part of Madhyapradesh such as: the temple of love and beauty – Khajuraho (world heritage site), the hidden place of Bundelas- Orcha, the Nabab city of lake- Bhopal, Buddhist paradise – Sanchi, Yotirlinga site- Mahakeleswar, Omkareswar, Historic city of joy- Mandu, the palace of Orcha, Maheswar and Indore. And many more. 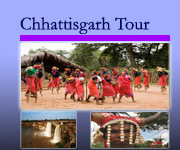 Upon arrival at Khajuraho airport meet our representative and transfer to nice hotel. Afternoon visit the western group of temple and excursion the language of stone and also watch the light and sound programme during evening inside of western group of temple. Overnight at the same hotel. Early stand up to explore the ancient jain temple at the eastern group of monument at Khajuraho and then departure for Orcha and check in a nice palace hotel at Orcha. After noon sightseeing of Orcha. Orcha: literally the hidden place, once the capital city of Bundelas dynasty. Raj Mahal( superb murals), Raj Praveen Mahal(( near garden and Hammam, bath house). On the other side of the village, Dinman Hardol’s Palace( popularly known as Palki Mahal) etc overnight at Orcha. Morning proceed to Jhansi railway station and board the train for Bhopal and upon arrival in Bhopal (city of lake) check in a nice palace hotel on the top of hill area. Afternoon sightseeing of Bhopal – Taj-ul-Masjid( one of the largest mosques in India) walk near by the market and explore the activities of local and late afternoon relax at the upper lake of Bhopal. Morning visit the world famous Sanchi stupa (world heritage site), The great Stupa of Sanchi, built by emperor Ashok, has become an icon of India’s cultural heritage. Then drive to Udaygiri rock cut cave (5th c AD, Gupta period where special attraction is the legend story of god Vishnu’s 3rd incarnation- Varaha depict there very clearly. Return back hotel and relax. Morning after breakfast drive towards to Mandu. Upon arrival at there check in a nice hotel on the side of lake. Afternoon visit the eco point and Baz Bahadur and Rani Roopmati palace. And many more…. Morning explores the city of joy again, to visit the famous Jahaz mahal (The palace like ship) and hindola Mahal, as well as ornamental canals, bath and pavilions. Jami Masjid, and Hoshang Shah’s Tomb, afternoon visit the champa Baoli, Dilawar Khan’s Mosque, Nahar Jharokha, Gada Shah’s shop and house, and taveli Mahal and also ashrafi Mahal, hati Mahal and Dariya Khan’s Tomb etc. 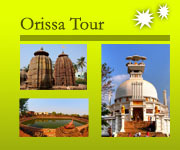 Departure for Omkareswar: visit shri Omkar Mandhata temple on the island houses on of the twelve Yotirlinga. Visit also Siddhanath Temple of 10th c AD. The 24 avatars, a cluster of Jain Temples and the Satmatrika temples. Then drive towards Maheswar. Check in a nice Ahalyabai palace afternoon visit the Rehwa weavers’ society. Morning while boating on the river Narmada, view the activities on the river ghat. Visit the Maheswar and kaleshwara, Rajarajeshwara, Ahileshwar temple then after lunch drive towards Indore visit there lal bag palace. And then departure to airport for you’re onwards journey. The capital of Madhyapradesh, Bhopal is a fascinating amalgam of scenic beauty, a proud heritage and modern urban planning. An afghan soldier of fortune, Dost Mohammed (1708-1740) was the founder of existing city, which is situated on the site of the 11th century city , Bhojapal, founded by the legendary Raja Bhoja. The two lakes, Upper and Lower, dominate the city and form its nucleus. Bhopal represent a harmonic symphony of the old and the new. The old city with its teeming market places, beautiful Mosques (Taj-Ul- Masjid, one of the largest mosques in India) and quaint palaces still bears the aristocratic imprint of its former rulers. A World Heritage Site( 46kms from Bhopal): Bhimbetka, is surrounded by the northern fringe of the Vindhya Mountains. The range is covered by huge rocks, and the discoveries here of over 600 rock shelters ( the largest group in the world) have revealed paintings that date back to the early Stone Age. The rock paintings in Bhimbetka are executed mainly in red and white with the occasional use of green and yellow, with themes taken from the every day events of aeons ago. The scenes usually depict hunting, dancing, music, horse and elephant riders, animals fighting, honey collection, decoration of bodies, disguises, masking and household scenes. Animals such as bisons, tigers, lions, wild boars, elephants, antelopes, dogs, lizards, crocodiles, etc. have been abundantly depicted in some caves. Popular religious and ritual symbols also occur frequently. A World Heritage Site( 46kms from Bhopal via Diwnganj), Sanchi is known for its stupas, monasteries, temples and Pillars dating from the 3rd century B.C. to the 12th century A.D. The Sanchi stupa was originally buit by the Mauryan Emperor Ashoka. A Chunar Sandstone pillar fragment, shining with proverbial Mauryan polish, lies near Stupa 1 and carries the famous edict of Emperor Ahsoka’s warning against schism in the Buddhist community. The four gateways of the Stupa built in the 1st c B.C. with stories of Buddha’s past and present carved on them are the finest specimens of early classical art. The adjacent town of Vidisha and the 5th c A.D. Udaygiri Caves are also well worth a visit. World Heritage Site: The temples of Khajuraho are India’s Unique gift to the world, representing a paean to life, to love and to joy; perfect in execution and sublime in expression. Life, in every form and mood, has been captured here in stone testifying to the craftsman’s artistry and the extraordinary breadth of vision of the Chandela Rajputs. Architecturally too, the temples of Khajuraho are unique, being different from the temple prototype of their period. Each of the chief compartments is mounted by its own roof, grouped so that the highest is in the centre, the lowest over the portico, a highly imaginative recreation of the Himalayas, abode of the gods. The Khajuraho temples were built in a short span of a hundred years, between 950-1050 A.D. in a truly inspired burst of creativity. Of the 85 original temples in Khajurabo, 22 still survive, constituting one of the world’s greatest artistic wonders. Legends of Love in the City of Joy, Mandu is a celebration in stone of life and joy. It is a tribute to the love shared between the poet- prince Baz Bahadur and his beautiful consort, Rani Ropmati. Perched along the Vindhya ranges at an altitude of 2000 feet, Mandu’s rulers built exquisite palaces like the Jahaz and Hindola Mahal, ornamental canals, baths and Pavilions. Each of Mandu’s structures is an architectural gem, some of them outstanding like the massive Jami Masjid and Hoshang Shah’s Tomb, the architectural isnspiration for the Taj Mahal. The glory of Mandu lives on, in its palaces and mosques’, in legends and songs, chronicled for posterity. Situated on the banks of the sacred river Shipra ( 55km from Indore), Ujjain , which sis the modern name of Ujjayini, abounds in temples, with ancient traditions. Desecrated and despoiled time and again, the structures that stand today are of a more recent date, renovated or rebuilt over the years. The magnificence and the awesome spectacle of the bathing ritual at the Simhastha ( Kumbha Mela) defies description. The temples form an integral part of the city and contribute to the continuity of Ujjain’s tradition of greatness. The most famous of these is the Mahakaleshwar Temple which houses one of the tewelve “ Jyotirlings”. It was a glorious city at the dawn of Indian civilization when it was Mahishmati, this temple town on the banks of the river Narmada finds mention in the Hindu epics of Ramayana and Mahabharata. Revived to its ancient position of importance by the Holkar queen Rani Ahiyabai of Indore, Maheshwar’s temples and mighty for-complex stand in quiet beauty, mirrored in the river below. Introduced into Maheshwar 250 years ago by Rani Ahilyabai, the Maheshwari sarees are renowned throughout India for their unique weave. ( 77kms from Indore): The sacred island, shaped like the holiest of all Hindu symbols, “ Om” has drawn hundreds of generations of pilgrims. Here, at the confluence or the rivers Narmada and Kaveri, the devout have gathered for centuryes to Kneel before the Jyotirlinga ( one of the twelve throughout India) at the temple of shri Omkar Mandhata. And here, the works of Nature complement those of Man to provide a setting awe-inspring in its magnificence. A Living Heritage of Heroism, a multitude of reigning dynasties, of the great Rajput clans of the Pratiharas , Tomars have left an indelible etching of their rule in this city of palaces, temples and monuments. The magnificent momentoes of a glorious past have been preserved with care , giving Gwalior a unique and timeless appeal. 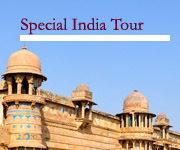 Gwalior Fort: Standing on steep mass of sandstone, Gwalior Fort dominates the city and is its most magnificent monument. The magnificent outer walls of the fort still stand, two miles in length and 35 feet high, bearing witness to its reputation for being one of the most invincible forts of India. This imposing structure inspired Emperor Babur to describe it as “ the pearl amongst the fortresses of Hind”. (112 km from Gwalior) Shivpuri is steeped in the royal legacy of its past, when it was the summer capital of the Scindia rulers of Gwalior. Its royal ambience lives on in the exquisite palaces, hunting lodges and graceful, intricately embellished marble chhatris. (127 km from shivpuri): chanderi, surrounded by hills, lakes and forests is very picturesque. The old Chaneri city has a number of Jain temples of the 9th and 10th centuries, a historic fort dating back to the Mughal period and several monuments of the Bundela Rajpurts. Chanderi also has a craft centre, famous all over india for its exquisite sarees and brocades. ( 119 km from Gqalior; 16km from Jhansi): Orchha’s grandeur has been captured in stone and frozen in time; a rich legacy of the ages gone byh. The palaces and temples built by its Bundela rulers in the 16th and 17th centuries, retain much of their pristine perfection. Strewn around the area are little shrines and memorials, each with its own poignant history, each contributing to the nostalgic beauty of Orchha. The exquistite Jehangir Mahal, a tiered palace crowned by graceful chhatris is a must-see. In Raja Mahal and Laxminarayan Temple, vibrant murals bring the walls and ceilings alive. Also worth visiting and the Chaturbhuj Temple, Ram Raja Temple and chhatris on the banks of the river Betwa. The sound and Light show at Raja Mahal in Orchha is a thrilling experience which takes you throught the pages of history. It narrates the discovery of Orchha by a king on hunt and rise and fall of the mighty kins, great battles, saucy romances and feats of valour. (175 km from Khajuraho; 78km from Satna): Chitrakoot, “ the hill of many wonders”, nestles peacefully in the northern region of the Vindhyas. It is a place of tranquil forest glades, quiet rivers and streams, where calm and repose pervade. Chirakoot also has a spiritual legacy that stretches back to the legendary ages; it was in the forests of Chitrakoot that Rama and Sita spent 11 of their 14 years of exile.